Manila, Philippines - PAGASA on Sunday, September 29, 2013 at 5:00p.m. issued weather bulletin no. 1 for Typhoon Quedan. The weather bureau said that the Low Pressure Area (LPA) at East of Guian, Eastern Samar has developed into a tropical depression and was named 'Quedan'. At 4:00 pm today, the center of Tropical Depression or Bagyong “QUEDAN” was estimated based on all available data at 900 km East of Guiuan, Eastern Samar (11.7°N, 135.0°E). It has a maximum winds of 45 kph near the center and forecast to move North Northeast at 7 kph. 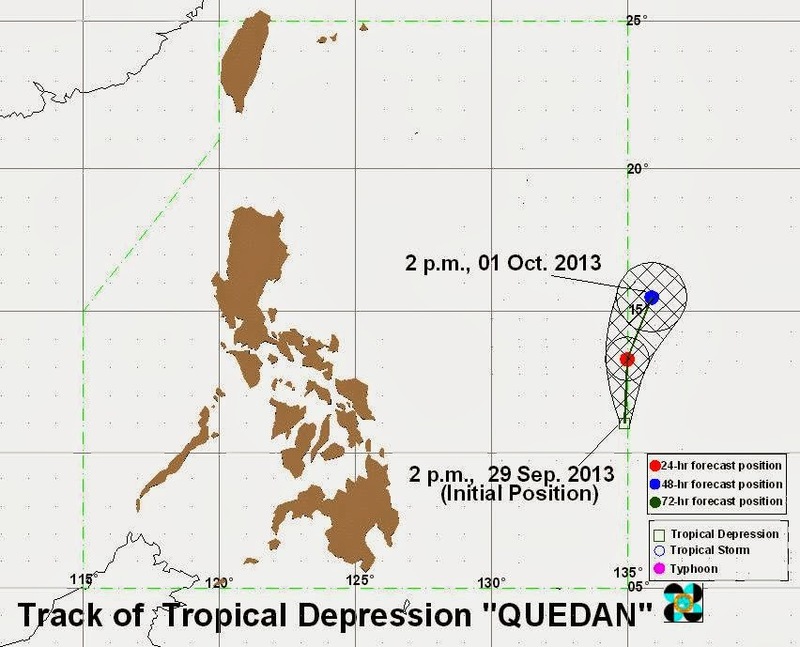 Tropical Depression “QUEDAN” is expected to be at 930 km Northeast of Guiuan, Eastern Samar by tomorrow afternoon. By Tuesday afternoon, it is expected to be outside the Philippine Area of Responsibility (PAR) at 1090 km Northeast of Guiuan, Eastern Samar. The estimated rainfall amount is from 5 – 7.5 mm per hour (moderate – occasionally heavy) within the 300 km diameter of the Tropical Depression. PAGASA advised that tropical Depression “QUEDAN” will not yet affect any part of the country. However, the public and the disaster risk reduction and management council concerned are advised to take appropriate actions and watch for the next bulletin. For more information and queries, log on to www.pagasa.dost.gov.ph or please call at telephone numbers 927-1335 and 927-2877 — with Jhaira Indiago.